While embroidery can be large, formal and detailed, it doesn't have to be. Small, playful embroidery patterns are cute and so fun to stitch. 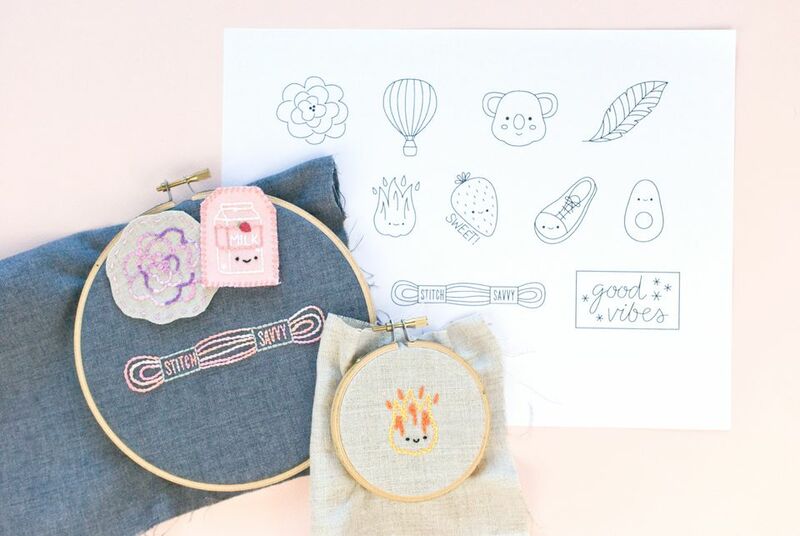 With motifs ranging from nature to kawaii (Japanese for "cute") to fun phrases, these free patterns are sure to be a delight to stitch on pins, patches and more. Because each of the 12 patterns only measures a few inches, you can work up a simple design or two in an evening. Or, take some time and fill in the patterns with satin stitch to create a small but special embroidery. Some of these patterns are designs that kids will love, including a few that are inspired by emojis. But you can easily skip stitching the faces if they aren't for you. Make them your own as you stitch! All 12 patterns are on one JPG file. Download the mini embroidery patterns and print the entire page in "landscape" mode on a standard size piece of paper. This will make them a good size for most small projects. You can also open and edit the file in any image software to resize the patterns or print only the motifs you want. Image software is also useful for reversing the images if you plan on using an iron-transfer pen. Mark the patterns onto your fabric using one of these five transfer methods. Or, if you plan on using all or most of the designs, print the entire page onto a sheet of water-soluble stabilizer for fast and easy pattern marking. After your fabric is in an embroidery hoop, it's time to start stitching! Prepare to get creative, because there's really no right or wrong way to stitch any of these designs. With the small size of these motifs, working with one to three strands is best, but it's possible to use more. The flower in the photo uses all six strands! If you're just getting started in embroidery, work the patterns in the stitches you are most comfortable with. Back stitch, french knot and detached chain will take care of every part of these patterns. Some stitches will add a lot to certain motifs. For example, stem stitch looks like the twisted threads for the skein of floss. Satin stitch makes the pit of the avocado really stand out. And for the faces, fly stitch worked as a gentle curve makes a great smile. Mini patterns like these are perfect for adding to a number of projects, and with such a variety of styles, you'll find lots of places to work them into your stitching. This collection is good for making pins and badges, using any of the 4 embroidered patch techniques on this site. Choose your method before starting to stitch! Add these designs onto journal covers, pockets, small zip pouches, coasters and more. You could even enlarge the designs or repeat a single pattern (such as the feather) to create a larger pattern. Note: As a reminder, these patterns are copyright Mollie Johanson, but they may be used for both personal and cottage industry projects.